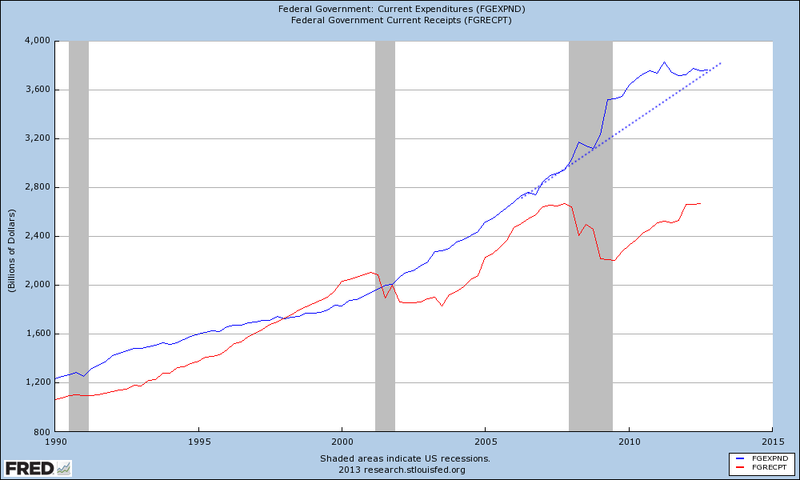 Because federal spending stopped growing for almost all of the Obama administration, we’re at spending levels now that we would have been if spending had been set at a fixed rate of growth in 2002. In other words, we’re likely spending no more money this year than we would have if President Bush had remained in office, Republicans had retained control of Congress, and there had been no recession. What’s creating these massive budget deficits is the revenue side, where tax receipts haven’t come anything close to returning to “normal” like they did between 2005 and 2007. If you take the recession out of the equation, our budget deficit drops from $1.3 trillion to somewhere between $200-300 billion in 2013. America has a revenue problem, and getting unemployment down to 4% as fast as humanly possible will solve most of it without having to cut a dime of spending. We’ve already effectively cut spending by reigning in spending growth at a faster pace than even during the Clinton years when the budget was balanced. Now you have the facts, it’s time to reassess your views.